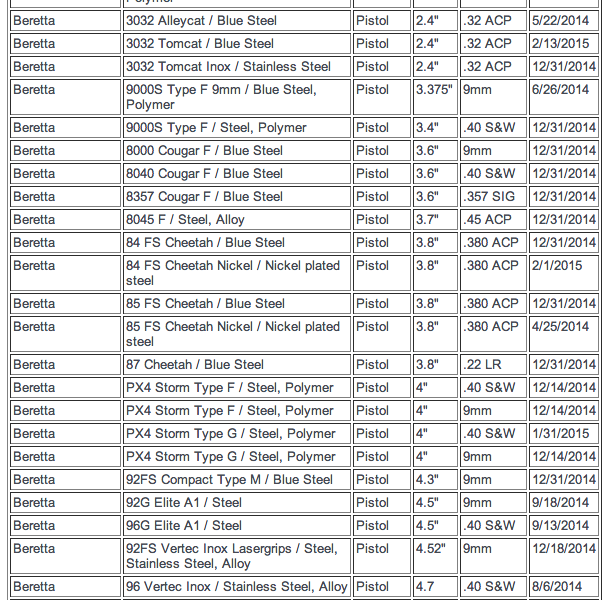 Just search for all firearms, and you’ll notice pretty quickly that 90% of them are expiring at some point this year. What does this mean? It means that unless these manufactures adopt California’s ridiculous requirements for handguns, they will begin falling off the list, and you won’t be able to purchase a new one in California. Which means eventually, with no new guns coming into California, you won’t be able to buy one, because no one will be selling theirs in a private party transaction since they can’t get anything else. Write to your congressmen and tell them to overturn this ridiculous law requiring this micro-stamping. The list seems to be up to date, I didn’t see Lealand Yee on it.